The successful introduction of new methods for managing medically unexplained symptoms in primary care is dependent to a large degree on the attitudes, experiences and expectations of practitioners. As part of an exploratory randomised controlled trial of reattribution training, we sought the views of participating practitioners on patients with medically unexplained symptoms, and on the value of and barriers to the implementation of reattribution in practice. A nested attitudinal survey and qualitative study in sixteen primary care teams in north-west England. All practitioners participating in the trial (n = 74) were invited to complete a structured survey. Semi-structured interviews were undertaken with a purposive sub-sample of survey respondents, using a structured topic guide. Interview transcripts were used to identify key issues, concepts and themes, which were grouped to construct a conceptual framework: this framework was applied systematically to the data. Seventy (95%) of study participants responded to the survey. Survey respondents often found it stressful to work with patients with medically unexplained symptoms, though those who had received reattribution training were more optimistic about their ability to help them. Interview participants trained in reattribution (n = 12) reported that reattribution increased their confidence to practice in a difficult area, with heightened awareness, altered perceptions of these patients, improved opportunities for team-building and transferable skills. However general practitioners also reported potential barriers to the implementation of reattribution in routine clinical practice, at the level of the patient, the doctor, the consultation, diagnosis and the healthcare context. Reattribution training increases practitioners' sense of competence in managing patients with medically unexplained symptoms. However, barriers to its implementation are considerable, and frequently lie outside the control of a group of practitioners generally sympathetic to patients with medically unexplained symptoms and the purpose of reattribution. These findings add further to the evidence of the difficulty of implementing reattribution in routine general practice. Approximately 20% of patients present physical symptoms in primary care which general practitioners (GPs) are unable to explain by physical disease [1, 2]. These patients frequently receive extensive investigation, referral and treatment for medically unexplained symptoms (MUS). However such interventions are often ineffective [3–6] and these clinical encounters can lead to dissatisfaction on the part of both doctors and patients . For patients it may create a frustrating dependence on primary care consultations which generates ambivalence, alienation and unhappiness with medical contact . Reattribution is a structured intervention, designed to provide a simple explanation of the mechanism of a patient's MUS, through negotiation and other features of patient-centred communication, and to be delivered during routine consultations . 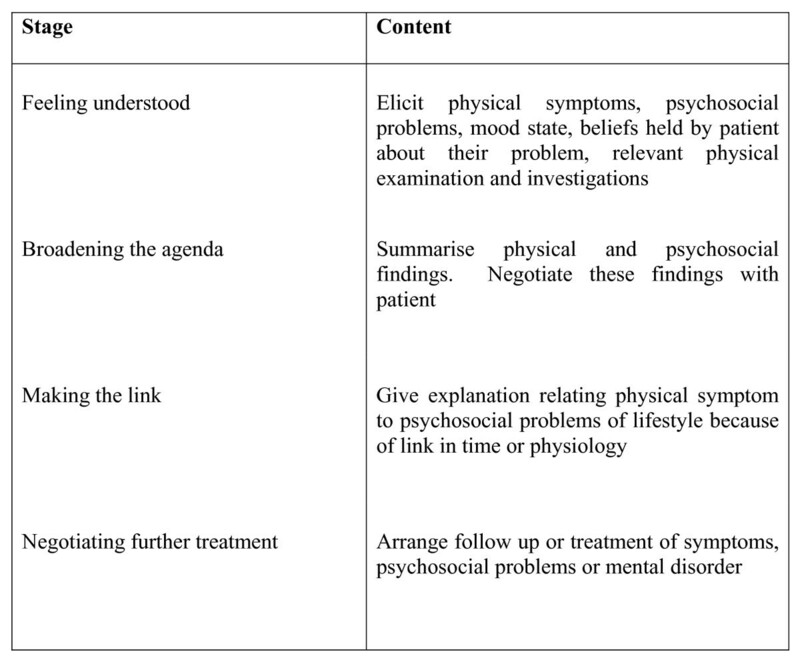 It has four stages: enabling the patient to feel understood; broadening the agenda beyond physical symptoms; making the link with psychosocial issues; and negotiating further treatment  (See Figure 1). Content of the Reattribution Intervention. Early studies suggested reattribution had promise as a simple and effective intervention that GPs could employ on a routine basis for patients with MUS [11–14]. However the results of recent randomised trials indicate that, whilst the techniques of reattribution can successfully be taught to GPs, and do have a measurable impact on practitioner behaviour in consultations about MUS, it is more difficult to identify tangible or lasting benefits in terms of improved outcomes for patients [15–17]. The reasons for the apparently limited efficacy of reattribution in routine clinical practice are complex. They include: the impact of contextual factors within the organisation and delivery of primary care ; and the expectations of patients with MUS about the type of care they should receive from GPs. Patients may have concerns that their needs for treatment, explanation and support will not adequately be met by doctors who appear to be looking for psychosocial rather than medical explanations for their symptoms . The attitudes, experiences and expectations of GPs themselves are also important, since they are essential to the successful implementation of any new method for managing MUS in primary care. It is therefore necessary to ascertain what GPs value about reattribution as an intervention for MUS, and the feasibility of implementing it in everyday clinical practice. In order to explore these issues, we conducted a questionnaire survey and undertook qualitative interviews with GPs who were taking part in an exploratory RCT of reattribution training in north-west England . The setting for this study was 16 practices in the north-west of England. The study sample was composed of the practitioners (73 GPs and one nurse prescriber (NP)) taking part in an exploratory randomised control trial of the effects of reattribution training on GP communication behaviour with patients presenting with persistent MUS. The six hour (two session) training programme was delivered by a health facilitator to all members of the practice team . The study was approved by the North West multi-centre research ethics committee. Practices had a median of four (range two to 10) GPs. Three practices served inner city populations, one a rural population and 12 practices urban populations that included some inner city areas. The GPs were mostly aged 35 to 50 (n = 45, 60%), with 10 (13%) under the age of 35 years and 19 (25%) over the age of 50 years. Thirty-eight (51%) were male. There were no differences between the training groups in terms of GP or practice characteristics. All 74 practitioners were invited to participate in an attitudinal survey. Practitioners who had received reattribution training (RT) were asked for their views on: patients with persistent MUS (three statements); managing patients with MUS (four statements); the process of RT (five statements); and putting RT into practice (six statements). Practitioners who had not received RT were given only the first two sets of statements. Ten statements were framed negatively, and seven positively. Responses were in the form of a 5 point Likert scale. Responses were analysed using SPSS version 15.0, first generically and then to identify significant differences between practitioners who had or had not received RT. Qualitative interviewees were purposively selected by MT and JGH (with advice from JAH, SP, LG and CD) from questionnaire respondents, in order to generate as wide a variation of views as possible. The sampling criteria included: respondents from each practice (to ensure all participating practices were represented); the practice setting (rural, suburban; inner city); the number of patients recruited by GPs into the trial; entry into training or control arm of the trial; gender and age of the GP; and participants' responses to two attitudinal questions about patients with MUS: 'I think patients with MUS take up too much time, which I could use more productively with other patients'; and 'There's a lot of patients for whom reattribution does not work'. Twenty four interviews were conducted, by MT and JGH, between August 2005 and May 2006, up to 31 months after practitioners were recruited into the study. Sixteen interviewees were women. Three were aged under 35, 14 were between 35 and 50, and seven were over 50. Nine worked in inner city practices, 14 in suburban practices, and one was from a rural practice. They had recruited between 0 and 11 patients to the trial (mean 3.3; median 3). Twelve were in the training arm of the trial and 12 were in the control arm. The selected sample represented the full range of responses to the two identified survey questions. A topic guide invited participants' views on patients with persistent MUS and their management of MUS. For those who had been trained in reattribution, further prompts invited views on the value and benefits of reattribution, and also on any barriers to its implementation in practice. Interviews were held in person, in the respondents' place of work at a time of their choosing. Respondents were remunerated for taking part. Interviews were audio-taped and transcribed verbatim. Transcripts were read and re-read by JGH, CD and SP to familiarize and immerse the researchers in the data. Patterns and themes within the transcripts were identified and notes made within the margins of transcripts. Following principles of grounded theory research, meetings were held with the whole research team to discuss and identify key issues, concepts and themes arising from the data, and to group them thematically to construct a conceptual framework . The thematic framework was applied systematically to the data. When devising the conceptual framework the research team were mindful of the aims of the research. All transcripts were indexed by JGH and then collated together within each code. The range and dimensions of each category and sub-category were identified. Conceptual connectors were sought to understand how categories and subcategories were linked at the level of properties and dimensions. Seventy (95%) of the 74 practitioners in the sample responded to the survey. Of these, half had received RT. The attitudinal statements, and range of responses, are presented in Table 1. Respondents tended not to enjoy consultations with patients with persistent MUS. Although most did not think these patients took up too much of their time, a substantial majority reported that they often caused them considerable stress. They thought these patients are worth trying to help, and that they present interesting diagnostic and therapeutic challenges. However, most respondents reported that they often do not know how to help these patients. There were two significant differences in responses between practitioners who had received RT and those who had not, when analysed using one way ANOVA. Practitioners who had received RT were more likely to report that patients with MUS take up too much time (mean scores 3.26 vs. 3.83, F = 4.062, p = 0.048). However they were less likely to report that they often did not know how to help these patients (mean scores 3.11 vs. 2.29, F = 9.188, p = 0.003). Amongst respondents who had received RT, most reported that they found the training enjoyable, and disagreed that it had not taught them anything new. However most thought it was not easy to find time to concentrate on RT. Few thought that lectures or payment would have improved their experience of or engagement with RT. Trained respondents reported that putting RT into practice was fairly easy, and that it generally made consultations with MUS patients more enjoyable, although not quicker. However, most agreed that they had already forgotten some of the reattribution stages. Almost all considered that it often needed several consultations to complete all stages of reattribution, and very few disagreed with the statement that there are lots of patients for whom reattribution does not work. In this section of the paper we focus on the responses of twelve GPs who had received training in reattribution to questions about: a) limitations and benefits of reattribution; and b) barriers to its implementation in routine clinical practice. Participants voiced some criticisms of the training in reattribution. Some thought they were already doing it: 'it didn't give me anything new' [PGP11]. Concerns were also expressed about the time commitment, aspects of the format and content of the training programme and – commonly – the lack of reinforcement: 'supervision would have been nice' [PGP12]. However, they described both direct and indirect benefits from learning about reattribution (see Figure 2). GPs views of benefits of reattribution training. Respondents described many barriers to implementing reattribution in routine general practice. 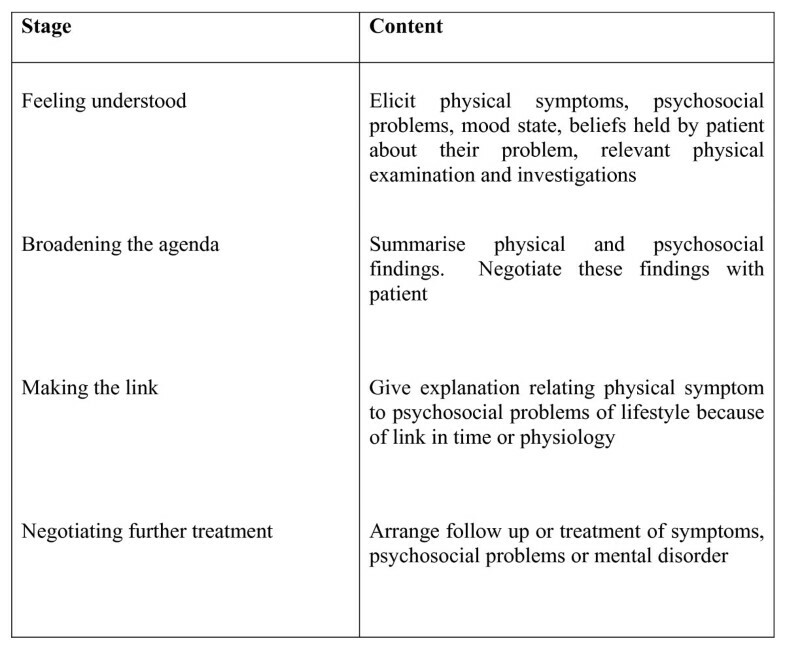 We categorise these as arising from the patient, the doctor, the consultation, the diagnosis, and the context of care (see Figure 3). 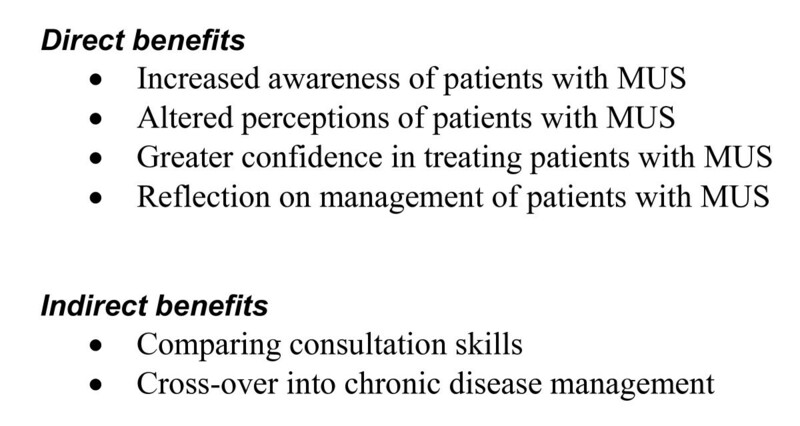 GPs' views of barriers to implementation of reattribution for patients with MUS. Respondents expressed various and occasionally contradictory opinions about the impact of gender, intelligence, class and ethnicity on the likelihood of patients' holding fixed beliefs in physical causation of MUS. However they all considered the presence of such beliefs to be a fundamental barrier to successful reattribution. Many GPs considered that patients' belief in organic causes of MUS could be perpetuated by family members since childhood, becoming a learnt behaviour or a strategy for coping with unhappiness. They were aware that their prior expectations of the patient could influence how likely they were to attempt reattribution. Two respondents acknowledged that their own emotional state or mood affected the likelihood of using reattribution. Respondents considered that patients' consulting behaviour can make it difficult to apply reattribution, particularly if they choose to consult with different GPs within a practice. However, GPs were not always critical of their patients' unwillingness or inability to communicate with their doctor sufficiently to allow them to broaden the agenda. Many GPs commented that patients do not present solely with MUS, but rather have numerous symptoms, some with an organic basis and some with a psychological underpinning. The presence of organic and medically unexplained symptoms can make it harder for GPs and patients to disentangle the causes of their symptoms. Respondents commonly reported insufficient time to deal effectively with MUS patients, with busy surgeries and brief appointments pushing them away from reattribution and towards short-term solutions. Some GPs thought that the Quality Outcomes Framework (QOF) compounded these time pressures, and detracted from their ability to reattribute. There was a common view that contact with secondary care was unhelpful, with an increase in inappropriate physical diagnoses, and greater entrenchment in symptoms. Responses to the questionnaire survey indicated that these practitioners were generally sympathetic to patients with MUS, but often found them a source of stress and difficult to help. Although respondents who had received RT tended to be less positive in their views about patients with MUS, they were more confident that they knew how to help them. Respondents generally enjoyed the process of training, but often forgot key elements of reattribution, and presented mixed views about the ease and practicality of its implementation in practice. 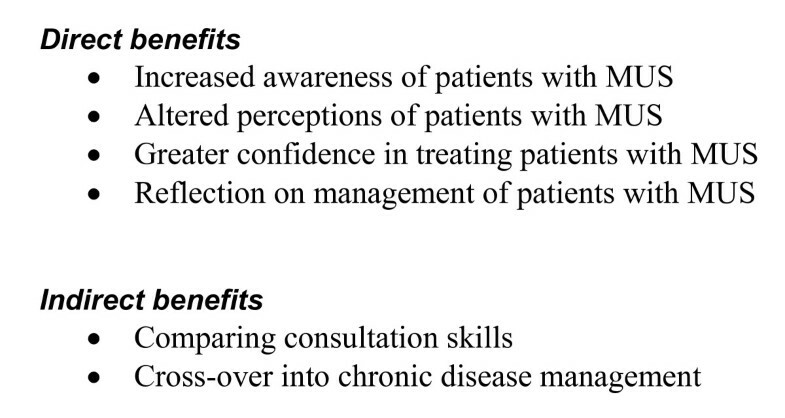 The participants in the qualitative study who had received RT described direct benefits from reattribution, including a greater sense of confidence and coherence when consulting with patients with MUS, and also indirect benefits including sharing consultation skills and application of new skills in the management of chronic disease. However they also reported multiple interlinking barriers to the successful implementation of reattribution in routine practice. Barriers at the patient level included the perception of entrenched views about physical causes of symptoms that were not amenable to change, compounded by learned behaviours and secondary gains. Doctor barriers included lack of skill, negative expectations of the patient, concern about encouraging dependence and personal emotional states. Barriers within the consultation included patients choosing not to consult with a regular doctor or being unwilling to share private information, and GPs' responses to particular patients. Diagnostic barriers were the frequent combination of explained and unexplained symptoms, and the nebulous definitions of MUS. Barriers in the healthcare context included time, organisational requirements, concerns about the negative impact of secondary care and the fear of the medico-legal consequences of missing physical diagnoses. Additionally, they report the complexity of working with degrees of uncertainty which are difficult to resolve. We have previously demonstrated that this group of GPs is more sympathetic towards patients presenting with MUS, and places greater value on their own psychosocial skills in relation to such patients, than GPs who do not wish to take part in research of this kind . Furthermore, we have shown in this study that they see substantial direct and indirect benefits of reattribution. They may therefore be taken as a group of doctors who tend to be well disposed towards the implementation of reattribution within routine clinical practice in primary care. For these reasons, the many and various concerns they express about the limited scope for implementing reattribution deserve serious consideration – coming from a group of 'critical friends' rather than from neutral or even hostile observers. We see this as a major strength of this study. By definition, therefore, a limitation of this study is that the views of these GPs cannot be assumed to be representative of their discipline: the relatively high proportion of female participants in the qualitative survey, compared to the proportion of female GPs in England as a whole also indicates unrepresentativeness. Secondly, while most of the barriers they discuss are common across all healthcare settings, there are several organisational constraints that are specific to healthcare in the UK, such as ten minute consultations and the Quality and Outcomes Framework , and may not be generalisable elsewhere. We also acknowledge that the metaphor of 'barriers' used by the research team is based on the assumed ability of participants to implement change, while operating within a highly complex set of diagnostic and organisational contexts . This is the first study to describe the views of GPs about the benefits and barriers to implementing reattribution in routine clinical practice. Our methods, combining structured attitudinal responses with semi-structured interviews with a purposive sample of GPs, were chosen to allow as wide a range of perspectives as possible to emerge. This paper is therefore takes forward previous research in this field, which has demonstrated changes in GPs' attitudes to patients with MUS following reattribution by quantitative means [11, 15, 23], but has not combined this with qualitative methods to gather their detailed views about reattribution and how it may work in practice. In apparent contrast to our quantitative finding, Danish GPs who had been trained in reattribution reported less concern about time spent with MUS patients : however this study reported within-subject differences over time, whereas we compared attitudes of trained and non-trained respondents. These GPs described a complex and interlinking set of barriers to the implementation of reattribution. Some of these observations could be regarded as stereotypical and partial: the frequent tendency to blame time constraints for difficulties in applying reattribution in practice can be seen as an example of a 'culturally honourable' excuse, a means of mitigating responsibilities when behaviour is questioned . 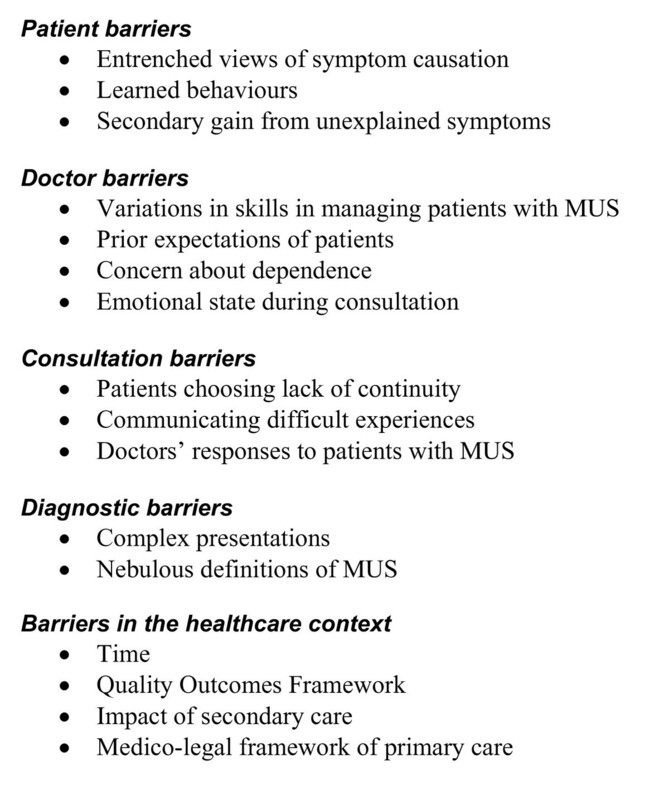 Most of the barriers described by these GPs, however, indicate a more nuanced and reflective response to the problems of managing patients with MUS, including a ready acknowledgement not only of the difficult diagnostic and organisational context within which they have to operate, but also of the significance of their own attitudes and personal responses. Although they value the use of reattribution for patients with MUS, they do not always feel able to take on the work involved, or to shoulder the burden of responsibility that may ensue . In this sense at least, the barriers they describe may not merely be obstacles to success, but may sometimes have a protective function for doctors acting within a difficult arena. There are important differences and synergies between GP and patient perspectives. GPs considered patients with MUS to have fixed physical attributions. However this view is not supported by recent evidence from primary care . Rather, patients choose to present physical attributions to their GP whilst withholding psychological components of their illness beliefs , which is a further barrier to GPs attempts to reattribute. It appears that both GPs and patients consider the problem to be complex, while believing that the other party holds a more simplistic view than their own. Despite recognising the value in preventing further contact with secondary resources, GPs admitted reluctance in abandoning pathology investigations. A driving force for this, from GPs' perspectives, is the medico-legal framework within which they work. Elsewhere patients describe pursuing a similar agenda; also out of fear of missing disease, either now or if presenting with future problems . It is important to recognise that both patients with MUS, and the GPs they encounter are heterogeneous groups, with competing attributions on one side , and varying degrees of empathy and skill on the other. A key question, therefore, is how to establish a common understanding of illness and treatment expectations. Our findings indicate the need for greater specificity, with regard to the patients and circumstances in which the techniques of reattribution may successfully be applied. This is of relevance both to future research and to current practice. Some of the barriers to reattribution reported by GP respondents were seen as immutable, such as the coexistence of unexplained and explained symptoms and (perhaps) the fixed beliefs of patients. It may therefore be useful for educators to focus on addressing those barriers to psycho-social interventions which appear more amenable to change, such as the need for increased skill, or for different medical attitudes towards patients with MUS. A stepped care approach, assuming only a basic level of knowledge, interest and skill amongst the majority of GPs, may also address the diagnostic and organisational barriers reported by our respondents . One way forward would be to take the ideal type of circumstances for the delivery of reattribution as described by these practitioners: patients whose MUS are associated with fluid causative beliefs, have no family expectations of illness and see nothing to gain from their symptoms; in consultations with regular GPs who feel well disposed towards their patients and comfortable in themselves, are confident in their consultation skills, can tolerate diagnostic uncertainty, and feel concerned neither about time pressures nor punitive organisational or medico-legal constraints. These appear to be the circumstances in which reattribution is most likely to prove successful. It may therefore be wise to demonstrate efficacy in relatively calm conditions first, before braving the elements and exploring more troubled waters. Medical Research Council (Grant reference number G0100809), Mersey Care NHS Trust and Mersey Primary Care R&D Consortium. Ethical approval: This study was approved by the North West multi-centre research ethics committee. We thank the following practices and their patients that took part in the study: Bousfield Health Centre; Brownhill Surgery; Brownlow Group Practice; Ellesmere Medical Centre; Heaton Medical Centre; Manor Health Centre; Moore Street Surgery; Pendleside Medical Practice; Primrose Bank Medical Centre; Roe Lee Surgery; Somerville Group Practice; Stonehill Medical Centre; Unsworth Medical Centre; Victoria Park Health Centre; Villa Medical Centre; Westmoreland General Practice. We also thank Nigel Crompton, Marie Evans, Elaine McVeigh and Victoria Wilson, who undertook reattribution training; Maria Towey (MT) who undertook some of the qualitative interviews; and Francis Creed who helped to develop the protocol and was a grantholder. Finally, we thank Kurt Fritzsche and Marianne Rosendal for their reviews of a previous version of this paper. CD designed and analysed the questionnaire and drafted the manuscript. JAH organised and collated the attitudinal survey. JGH undertook qualitative interviews and initiated the qualitative analysis. CD, JGH and SP completed the qualitative analysis. RKM, LG, CD, PS, SP and ARR conceived the study, and participated in its design and coordination. All authors read and approved the final manuscript.